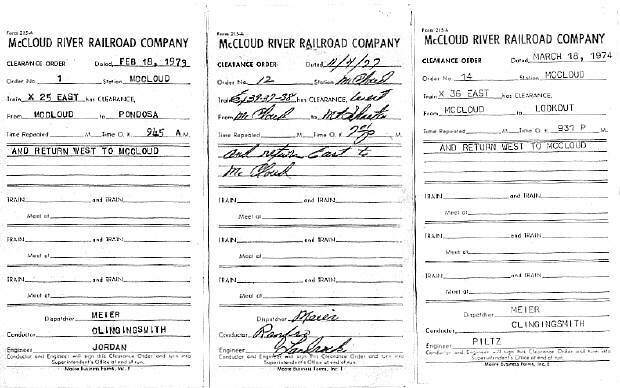 For most of its history, train movements over the McCloud River Railroad were governed by train orders. Train orders granted trains and other pieces of equipment authority to move from one point to another over the railroad. 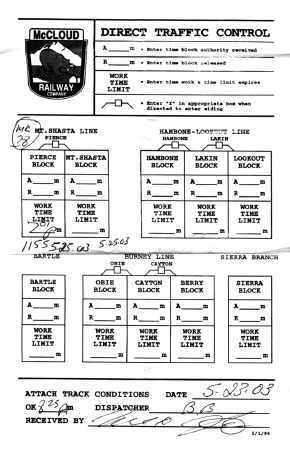 Meets with other trains would be spelled out in the orders. Other stipulations in the rule book spell out maximum allowable speeds within the DTC block that is held by two or more parties where no understanding between the parties is possible or can be reached. Blocks are released by those who have authority to hold them either by radio or by submission of a completed DTC block form to the dispatcher at the end of the tour of duty. In the scenario described above, if the maintenance of way crew finishes their work in the Cayton block and releases it back to the dispatcher before the train returns to McCloud, then the dispatcher will cancel the train crew’s previous joint work and time authority to be in the Cayton block, replacing it with an authority to occupy the block “all alone”. Finally, here are a couple of other forms relating to train movements. The first is a switch list, which spells out what cars are to be handled in that trip. 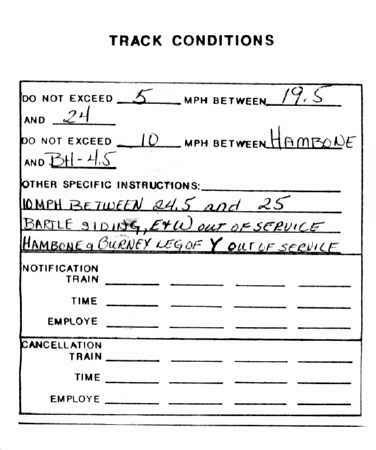 The second is a Track Conditions worksheet, with is issued to all train and track crews on a daily basis to inform them of any slow orders, malfunctioning crossing gates, out of service switches, or any other conditions that crews should be aware of. 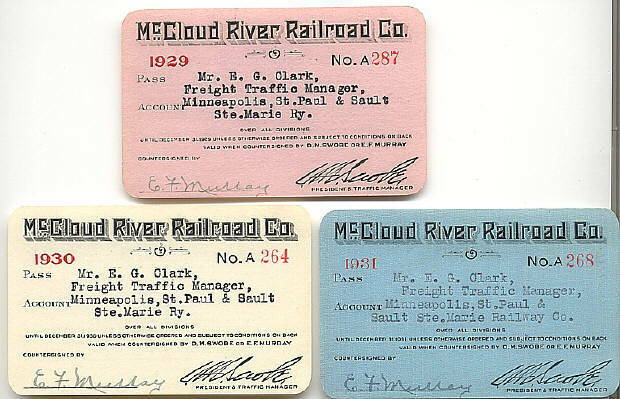 In the early 1900’s, it was common practice for common carrier railroads to issue passes to officials of other railroads. The passes essentially granted free passage over the issuing road to whoever the pass was issued to. It was not uncommon for the immediate families of employees to receive passes as well. These are examples of three passes issued in 1929, 1930 and 1931 to a Mr. E.G. Clark, Freight Traffic Manager for the Minneapolis , St. Paul & Sault St. Marie Railway (known simply as “The Soo Line” through most of its history). Passes are from the George Landrock collection.